Driver Removal or "Move It": These laws require motorists involved in minor crashes (where there are no serious injuries and the vehicle can be driven) to move their vehicles out of the travel lanes to the shoulder or other safe area before initiating the exchange of insurance information, or while awaiting the arrival of law enforcement and/or a tow truck. Authority Removal or "Remove It"": These laws provide authority (and immunity from liability in general) for designated public agencies to remove abandoned vehicles and spilled cargo from the roadway to restore traffic flow. "Move Over": Designed to protect incident responders and stranded motorists alike, "Move Over" laws require motorists approaching incident responders and vehicles to slow down and move over to an adjacent lane, when possible, to provide an increased safety buffer. Helping to prevent secondary accidents by having motorists move their vehicles out of the path of travel and allowing responders to remove debris or abandoned vehicles from shoulders or travel lanes. The responder community and State governments widely appreciate the importance of SQC. Several national-level initiatives affirm the role of effective SQC in assuring public safety, including the Full Function Service Patrol Handbook, the TIM Handbook and the National Unified Goal for TIM. However, while nearly all States have at least one of these laws in place, fewer than half have enacted all three core laws. Moreover, studies report that even in States with these laws, approximately 70% of motorists, and many law enforcement and transportation field responders, are unaware of them, suggesting that implementation of these life-saving laws is far from optimized. The Federal Highway Administration is implementing a new outreach program, Educational Outreach for Safe, Quick Clearance Laws and Policies, to promote implementation of and compliance with the three core SQC laws. This initiative seeks to advance SQC on a national level and will result in a shared and consistent understanding of responder and motorist roles and responsibilities in quickly clearing incidents and incident-related debris. 1NCHRP Synthesis 318, p. 19. Encourage State and local/tribal governments in the top 40 metropolitan areas to adopt and promote effective implementation all three SQC laws. Create awareness among motorists of these laws, and promote compliance. Encourage the automobile insurance industry and civic organizations to educate motorists about "Move It" and "Move Over" laws. Encourage DOTs to build strong Full-Function Service Patrols with a "first responder" mentality to support effective implementation of SQC strategies. Educate State and local political authorities about effective SQC implementation based on lessons-learned. While approximately 80% of States have at least one of these laws in place, only seven have enacted all three core laws. An Awareness Briefing package and supporting materials that explain the benefits of adopting all three SQC laws. 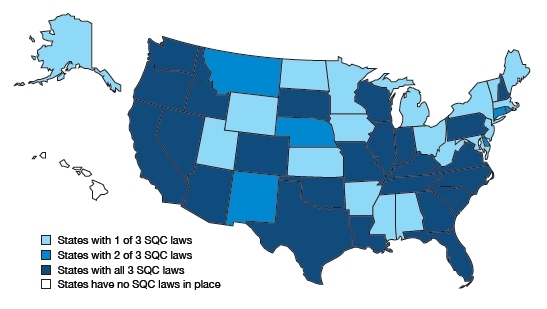 A Communications Strategy aimed at institutional decision makers and implementers responsible for promoting, implementing, and/or enforcing SQC laws in the 50 States. The strategy will focus on educating and equipping leaders at all levels within implementing organizations to successfully implement the three primary SQC laws in all 50 States, and to adopt the latest effective practices. An Operational Marketing Strategy designed to be used by stakeholders to promote and support widespread adoption and effective, sustained implementation of the core set of SQC laws across the country. Some outreach products, including talking points and fact sheets that can be used at State and local levels. FHWA established a stakeholder panel to help guide the project. The panel included decision makers from public safety and TIM domains across the U.S., as well as other stakeholders such as members of the automobile insurance industry, trucking industry, and civic organizations. These leaders shaped outreach messages, strategies, and products to accomplish SQC goals. Sharing the outreach products developed through this initiative with your colleagues and associates.